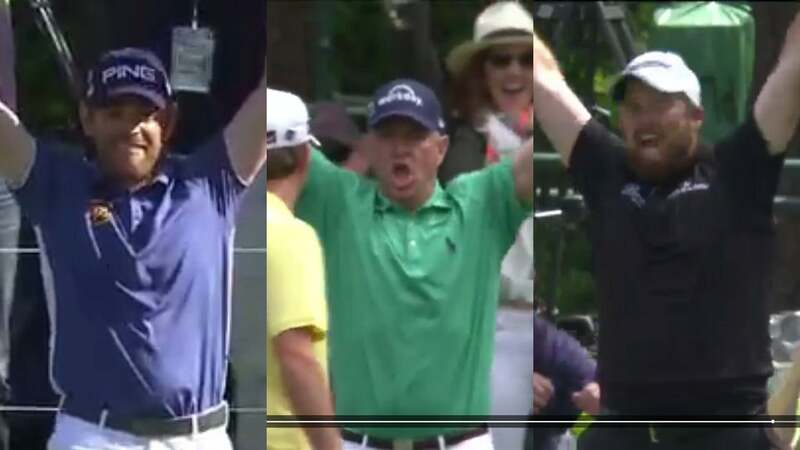 Louis Oosthuizen, Davis Love II, and Shane Lowry celebrate their Masters aces. Hours before Jordan Spieth's meltdown on the 12th hole Sunday at the 2016 Masters, something even more unlikely happened, if you can believe it. Three different players made holes-in-one on the iconic par-3 16th hole. How improbable is that? It had been four years since a single ace had been made in the Masters, let alone three in the same round on the same hole. Shane Lowry got the party started when he sunk the 16th hole-in-one on the 16th hole in Masters history. Ryder Cup captain Davis Love III followed suit only moments later with No. 17. Then Louis Oosthuizen took it to the next level when his tee shot on 16 bounced off of his playing partner's ball before dropping in for a 1 on the scorecard. You can watch all three aces below. Enjoy.